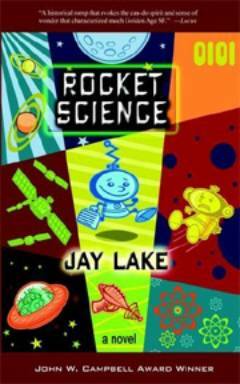 Jay Lake is the 2004 winner of the John W. Campbell Award for Best New Writer, on the basis of his many short stories, and was nominated for a World Fantasy Award for his editing, so it should come as no surprise that his first novel, Rocket Science is easily one of the best I’ve read this year. The novel is set in post-WWII Kansas where our first person narrator finds his life turned upside down when his best friend shows up with what appears to be a stolen German secret weapon. Hiding the German prototype in the neighbour’s barn, however, it becomes increasingly clear that this is no ordinary plane, but a four hundred year old artifact the German’s unearthed in the artic…in other words, an alien space craft. What makes Rocket Science so entertaining, however, is not just the usual “I’ve got a spaceship in my barn” storyline, but the way Lake manages to bypass the last forty years of my life to plug directly into my 13 year old hindbrain and plunk me down once again in the middle row of the Roxy Cinema for a new Saturday afternoon serial. Lake throws more curves, cliffhangers, Nazi spies, traitors, moonshiners, benevolent aliens, angora sweater babes, and trigger happy army commanders into his novel than any actual serial would have dared. And those guys had no restraint! But wait, there’s more! Not satisfied with merely romping through our childhood memories to deliver a page-turning adventure novel, Lake manages to add in another couple of layers for our adult forebrains too. As our protagonist finds himself sinking deeper and deeper into misadventure, he begins to realize that everything he knows about his small town Kansas life has been completely wrong, that practically everyone else has a guilty past or current secret they do not want him to expose, and that life is a lot more complicated than it appears. Lake even manages to convey a fair bit of character development as our hero loses his naivety, and as various other characters confront the realities of who they were or what they have become. As an extra bonus if you order now, Lake even manages to deliver an upbeat ending and an optimistic view of humanity, in spite the many villains and hard breaks that beset our hero. This is a protagonist that believes in the American dream, the progress of science, and that nice guys can finish first, and he almost makes you believe it too. I highly recommend Rocket Science and am convinced you’ll find it worth the trouble of tracking down through your local bookstore or direct from Fairwood Press.